This recipe is featured in Pampered Chef’s recipe book entitled “The Pampered Chef Dinner in Your Deep Covered Baker” which you can find chock-full of deliciousness. Om-nom-nom. Let’s see it, shall we? Drumroll…….. Without further ado, let’s get cookin’ !!! Thinly slice the mushrooms. Heat oil in a 12 in. skillet over medium high heat 1-3 minutes or until simmering. Add the mushrooms; cook and stir 3-4 minutes or until mushrooms begin to brown. Remove your skillet from the heat. Set aside 1 tbsp of the crumble bacon. Add remaining bacon to mushrooms and mix well. Meanwhile, cut the bread into cubes. In a mixing bowl, combine bread, milk, parsley, egg yolk, 2 tbsp of the rub, pressed garlic, salt and pepper. Mix well. Add your raw beef to the bread mixture; mix. Place two thirds of the meat mixture in Deep Covered Baker. Form into an 8.5″ by 4.5″ loaf. Gently press down on the center of the loaf to create a well. Sprinkle a 1/2 cup of the cheese in the well. Top with the bacon mixture and an additional 1/2 cup of the cheese. Place remaining meat mixture over filling; press to seal. Microwave, covered, on high for 14-17 minutes or until internal temperature reaches 145 F in the center. Meanwhile, combine ketchup and remaining rub; stir. Carefully remove the baker from the microwave, using oven mitts. Brush Ketchup mixture over meatloaf. Microwave, covered, on high 3-5 minutes or until internal temperature is 160 F in the center. 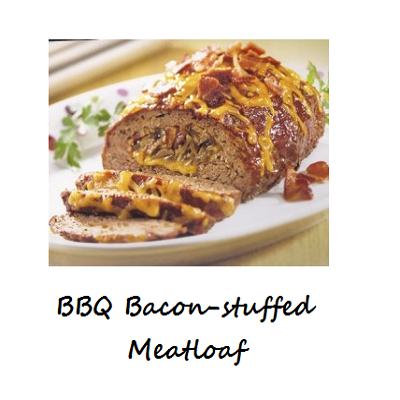 Sprinkle remaining cheese and reserved bacon over top of meatloaf; let stand, covered, 10 minutes before slicing. Paula’s TIP: want to make it Gluten-Free (GF)? replace the bread crumbs with either ~1/3 cup of GF oats, ground fine in our Manual Food Processor, OR ~1/3 cup shredded zucchini, squeezed and patted dry. replace our Smoky BBQ Rub with your favorite GF rub (Pampered Chef rubs may not contain gluten, but they are not made in a GF facility… so no guarantees).